Well, I've had the new issue for some time, but I've finally gotten this sore tooth thing under control! I've really been in a vegetable rut, so I was excited to try some stuff from the "Perfect Pairings" article. 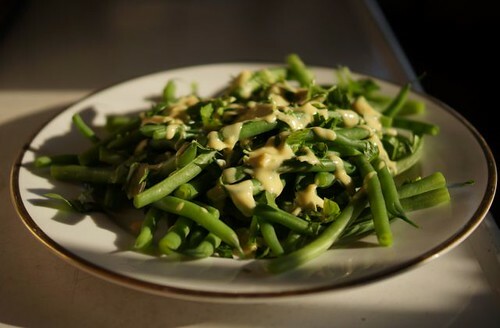 Here is the green beans with tahini-- very good, we loved the sauce. It was a bit garlicy (in a good way), and would be good as a salad dressing too. 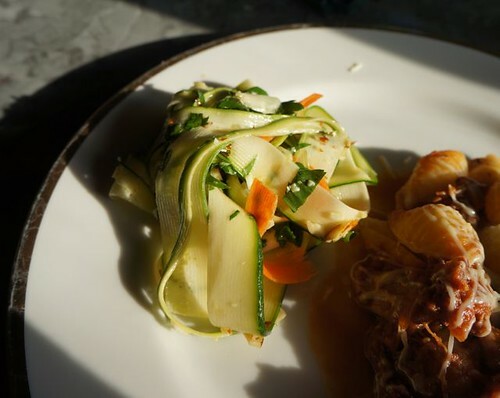 Here is the shaved zucchini salad (with carrots) with almond salsa verde ( http://www.finecooking.com/recipes/shaved-summer-squash-almond-salsa-verde.aspx) as a side to the FC ragu with sausage, natch. This salad is excellent-- even my zuc-hating husband went back for seconds. It is a bit garlicy, so do make sure that anyone you'll be kissing eats it too! The parsley/almond/lemon/garlic of the dressing really made the tender, slightly sweet zucchini ribbons into something special. As my husband said "it's almost like it's not zucchini at all". Yes dear, this is not your mother's zucchini-and-tomato stew. No dice with the kid, however-- she was content with carrot sticks. The new issue really has a lot of good stuff-- on to blueberry pie! I saw a picture of a vegetable tart on Pinterest just before I was going to make the zucchini recipe that you posted from the current issue and ended up making that instead, but I'll make the FC recipe soon, lord knows it is going to be a fantastic zucchini season. The recipe didn't say what size tart and the zucchini amount needs to be increased by 2. Mine is not so pretty because I was using an 11 inch pan and not having enough zucchini I had to scrunch up the dough to the edge of the completed vegetable circle, rustic is better, right? Hey ICD, I saw that tart on your blog, it's beautiful! The pork burgers look great too! I made the tres leches cake for a camping trip this weekend. Instead of a 9x13, I made two 9" rounds. 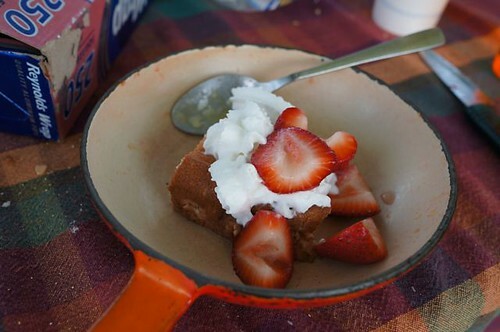 We had one round for dessert after dinner with a favorite aunt (the free babysitter) and brought the other one camping the next day -- it worked great for a camping dessert, with some ripe strawberries and spray whipped cream (roughing it!). Good stuff! I'd never had tres leches cake before, but it was really delicious, especially with the fresh fruit. Aunt Babysitter loved it too. The leftovers even made a great breakfast the next day-- I bet the coffee version would be superb for breakfast! 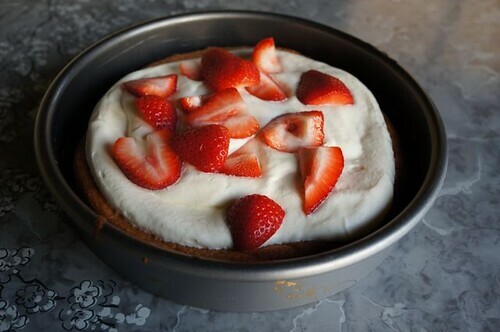 That looks so good...I have the cake on my to do list, might be today if it rains. I would prefer the smaller round version like the one you did since we don't make a lot of desserts. LOL some of the best dinners are camping dinners. The tart was fun to make and would certainly be a nice company dish and I can imagine making mini versions, might give that a try. Hey ICD, I agree that a smaller version is helpful, unless you are going to a big potluck! I bet you could freeze one of the two cakes and freeze the milk mixture separately-- the day you're ready to serve the second cake, just heat the milk again and soak. Unfortunately, it's hard to just make a half-batch, as the milk mixture has a can of evaporated milk and a can of condensed-- or maybe you could use the remaining soaking liquid to make Vietnamese iced coffee-- bet that would be good! For your tarts, I agree that mini ones would be really stunning-- maybe as an appetizer or light lunch with a little green salad on the side, yum. That tart looks beautiful! I think the "rough" edges add to the whole presentation. I just finished having the FC version for lunch. I really liked it but it was a bit salty for my taste so now I know I need to cut back on the salt next time. I'll post a picture in the next few days. It didn't look as pretty as the one in the issue. I scored some very very ripe mangoes and had some crystallized honey, and voila! 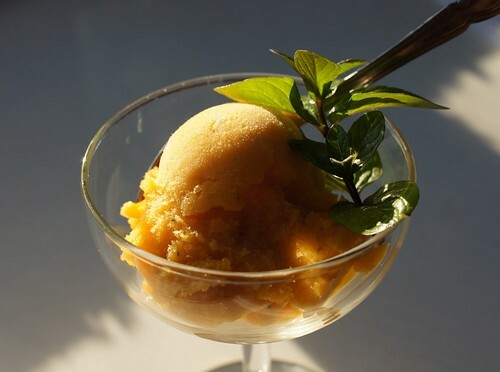 This sorbet is very rich, dense, smooth and sweet. I think I may have over-measured the honey a bit! With all this healthful eating, I may have to make the homemade bacon next! Ooh, that bacon is totally on my list! I'm looking forward to your report! To counteract all the healthful veg, I made the biscuits, which were quite tasty, but not very photogenic. I would make them smaller next time-- the recipe has a whole stick of butter and only makes 6 biscuits-- better to have mini-biscuits. I've got my eye on the blueberry pie too. So. . . . .how’d that bacon turn out? Don’t keep us in suspense! Were you happy with the result? I hope so too because I am splitting a pig with a friend and I just ordered the entire belly to be unsmoked! Bring on the bacon! ICD, what do you think?? Well, it was okay and I'm glad that I didn't invest in the entire pork belly, luckily our pig market had smaller chunks and will also cut to order so I wouldn't be eating bacon forever. I totally forgot that it was in the fridge vacuum sealed until I decided to make carbonara with braised bacon and had enough for a big pot of Lima beans, some baked beans and BLT sandwiches. I used some cherry, but mostly apple wood chips and by the time the smoker box had burned off the heavy smoke, I had a nice light aroma. I was doing this in the pouring rain by the way and it smelled like I was up in the mountains and every neighbor had a nice fire going, reminded me of fall. At any rate I ended up with about 3 lbs, just enough and it took about 4 hours in my SRG. I forgot to mention that I also took a look around for "making bacon" ending up doing a three a 3 day cure. So would I do this again, probably not since our pork markets have whole sides of bacon and peppered bacon, the work is done and for the most part I use pancetta more than bacon. Bacon and pastrami checked off my kitchen to do bucket list. Pancetta us still in the to do list and I use a lot so it might be worth the trouble. I'm still thumbing through the issue and have several pages marked for my "to make" list. I made sesame green beans last week a similar but not so garlicky recipe, might give the FC version a go. The FC Cooking Fresh #64 also has some fantastic dishes and since thet vegetable stands are now open up and down the highway, I can get some seasonal goodies to fill in the menus that I have to plan today for the rest of the week and the holiday weekend. So for today, the corn chowder and the cucumber feta salad is the plan for dinner tonight. Nice to get back to a little cooking from the issue, Ill report back, but already I think that I will roast the corn. This is amazing. Can't say much about my cooking for now, but someday I'll make foods like this one. The basicality of life begins with our Food. Three recipes from the current issue, all very good...drooling over burger recipes for the weekend. We're really loving your pics, Pie & ICD! Keep cooking from the issue and reporting back. We appreciate it! Thanks Mods, that is cool! I am all over that veggie article-- it gets my husband to eat his veggies!! I agree! you are both doing a great job with the photographs! I had to laugh, forgot to take a picture of the pretty burgers that I made, but managed to snap one of DH's burger or what was left of it...he like his cooked more than my med-rare. I loved it and I'm making at least 1 more burger this week. Ha, that is a true measure of the deliciousness of the burger! Which burger was it? The blue cheese one? We are still loving that salad with the zucchini ribbons and salsa verde-- my husband says it's the only good use for zucchini. I ran out of parsley, so I made it with mint and it was even better. ....before he takes one more bite! :) how wonderful that he loved them so much. Really a good compination friend, I thing it would be time consuming too.. Here are a few pictures of the recipes I have tried this issue. Not my best photos and with the tofu I was glad to have left a couple of bites or it would've all been gone. LOVED the tofu. The deviled eggs I must say were quite good too. I wasn't as big a fan of the rice and salad quinoa salads but will try other variations too. As far as I am concerned that crispy tofu is well worth making! Let me know what you think once you give it a try. Excellent, the crispy tofu sound great and your other dishes look great too! ICD, thanks for the bacon rundown. 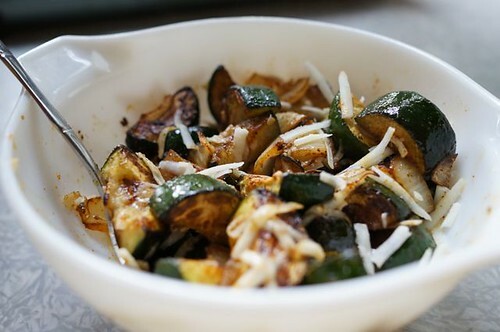 I had mixed success with the roasted zucchini with pimenton and manchego cheese (although I subbed smoked paprika and romano). I loved it, the kid hated it to the point of wiping the residue off her plate, and the husband liked it okay but said that the salad (shaved squash with almond salsa verde) was better. 1. in my experience one should always add water to piecrust by eye-- measuring is a bad idea because flour will have different amounts of water in it already and thus require different amounts of water. For example, in a dry climate one might have to add a lot more water than one would have to add in a hot, humid Chicago kitchen. 2. Speaking of water, given all the emphasis (everywhere, not just on FC) about measuring flour by weight, I think that measuring water by Tablespoons will give substantial variation-- especially multiplied over 5T. Given that water forms a menicus, it's very hard to get an even Tablespoon-- does one err over or under? Might be an interesting experiment. 3. I switched from the food processor back to my trusty pastry cutter some time ago for more control. The pie tasted great though! Needless to say, no lattice. Maybe next time-- when I use the same ingredients but my method, hmm. Certainly not photo-worthy with tarry-looking blueberry overflow everywhere! Tried the Spicy corn chowder (http://www.finecooking.com/recipes/spicy...). I skipped the chipotle and didn't have a potato or a red pepper, plus used whole milk instead of the half-and-half. So it was more brothy than thick, but really really good-- I scored some really lovely corn in downstate Illinois this weekend, made the soup so tasty. 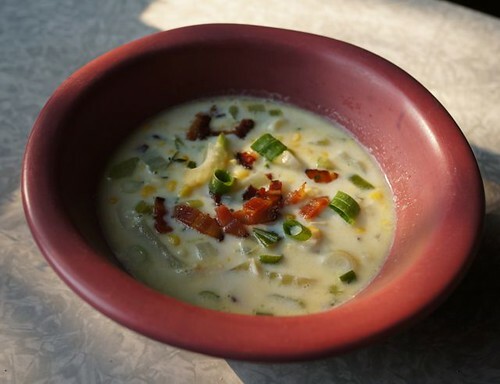 I love the combination of corn, onions, and bacon in a light, creamy broth. Husband loved it too-- kid wouldn't try it, so she had a deconstructed version (chicken noodle soup, corn on the cob, glass of milk, bacon nibbles).